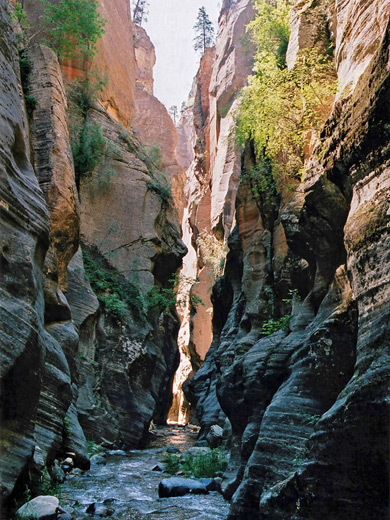 Three huge ravines merge to form the famous Zion Canyon - the Virgin River itself, Deep Creek and Kolob Creek, which has the longest stretch of narrows of all. 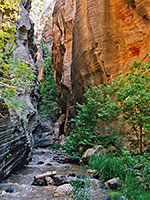 Beginning in the far north of Zion National Park near Lava Point, where the creek flows over a cliff and into a long series of waterfalls, potholes and cold pools, the canyon extends for 7 miles, deepening dramatically whilst widening only slightly, until it meets the Virgin River 6 miles upstream from the Gateway to the Narrows. 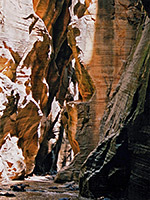 The upper third of the Kolob canyon is accessible only by a combination of rappelling and swimming, and presents quite a challenge to explore, but the lower two thirds is without any great obstructions, though still rather difficult to enter. The ravine becomes up to 1,200 feet deep and has beautiful, archetypal Zion scenery of towering, water carved cliffs of red and grey Navajo sandstone, lengthy sections of narrow slot canyons, occasional patches of bushes and wildflowers, all centered around a clear, fast flowing stream. The water originates from Kolob Reservoir several miles above the start of the canyon and varies in volume depending on the amounts being released from the irrigation dam. It is essential to check the flow rate in advance, as the upper technical section should not be entered if this is above 3 cfs. The lower part may still be safe, though as with all Zion canyons, recent rainfall and possibility of flash floods can also make the trip too hazardous. Kolob Creek begins almost at the highest point of the Kolob Plateau, 9,200 feet on the slopes of Kanarra Mountain, from where it flows across open meadowland for several miles into the reservoir, out via a dam along a wide valley with scattered holiday homes then turns away east, over the edge of the basalt plateau then begins to form its canyon after another 2 miles, at an elevation of 6,750 feet. 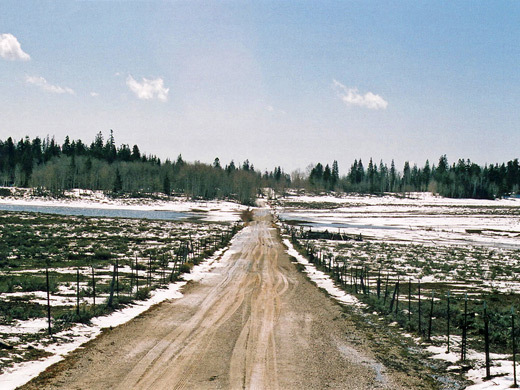 The Kolob area is accessed by the Kolob Reservoir Road, which is paved as far as the reservoir and open all year though usually snow covered for several months in winter. The starting point for the hike to either the upper or lower sections of the canyon is the West Rim Trailhead, reached by turning along the gravel side road to the Lava Point overlook, past Blue Springs Reservoir, then taking the left turn at a crossroads after 2/3 mile. This is a narrower track, quite steep and bumpy in places, soft and sandy in others, and likely to be impassable when wet. It curves round the Lava Point promontory, descending through pine forest to a small parking area at the trailhead, from where two long (maintained) back country footpaths begin - one across Wildcat Canyon and back to the Kolob Terrace Road at Lee Valley, the other down a long ridge (Horse Pasture), past the tops of several other deep ravines including Imlay and Heaps Canyons, eventually descending into Zion Canyon and intersecting the trail to Angel's Landing. The routes to Kolob Creek are not maintained, nor marked in any way. The top of the upper narrows is about 1 mile north of the trailhead - back up the road 400 meters, opposite the last bend, a developing trail leads into the woods, curves down and up a shallow side valley then follows old logging tracks, winding steeply down the side of the Kolob Creek drainage to the streamway, meeting it just above the first sheer drop where the canyon proper begins. The way into the lower canyon (the 'MIA Route') - the hike described here - begins by following the West Rim Trailhead road further east; though a gate, which may be locked, since vehicular access past this point is by permission only. Lava Point is within Zion National Park, as are the upper and lower thirds of the Kolob Creek canyon, so a $25 park entry fee is due. In addition, a permit is needed for through trips of Kolob Creek and any expedition that involves rope-assisted climbing, though not, presumably, for day hikes into the lower 2/3 of the canyon. 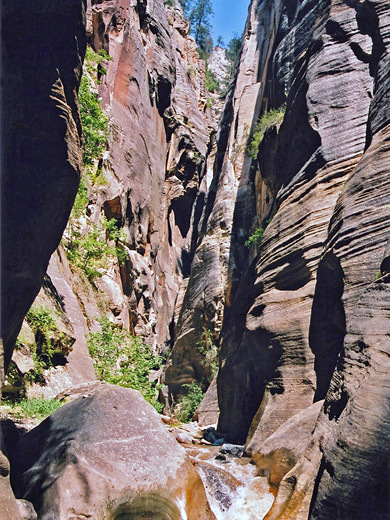 The creek is part of Zion's 'primitive zone', for which visitation is limited to 12 per day. 19 views of Kolob Creek. TopoQuest topographic map of Kolob Creek. Past the gate, the dusty track descends gradually down a long ridge, across open ground that allows distant views over cliffs and canyons, including Kolob Creek to the north and east, and Goose Creek to the south. The track branches several times, and links with various logging roads, many now disused, with the most travelled route leading to the MIA camp (MIA = Mutual Improvement Association, a youth program for the Mormon Church). The recommended route to Kolob Creek is to take the first left, just over 1 mile from the gate, then a right soon after. This becomes overgrown and crossed by occasional fallen trees once a side track, the only route still used by vehicles, leaves to the right. It descends more and more steeply, nearing the end of the ridge, and turns away sharply to the right at the very end, down to the valley floor where it meets a continuation of the earlier side track. Left here, the track soon reaches another junction, next to a picnic area with a few tables and a pipe supplying drinking water. Turning left again, the road curves back north, along the head of a side ravine on the right. This ravine is used to reach Kolob Creek, and the starting point is marked by a cairn on the right side of the road, just a few hundred meters from the picnic spot. The path drops down a slope through a thin belt of woodland and over a cliff edge into open land, the creek now visible far below, and descends at a 50° gradient down an extremely precipitous, rocky, dusty hillside. It is reasonably well used so easy to identify though not always easy to follow. The trail meets then follows the streambed of the left fork of the ravine, which soon joins the right fork. Upstream here is a nice slot section, while the combined drainage soon enters longer, deeper narrows with dryfalls at intervals, one of which is too high to climb. Bypassing requires quite a lengthy diversion, by climbing far up the bushy hillside on the left, first exiting the streamway a little before the narrows - up to a ridge then steeply down the far side, along another side gully and back to the main drainage. This part of the route is not always easy to identify. Kolob Canyon is close now, near enough to hear its rushing waters. 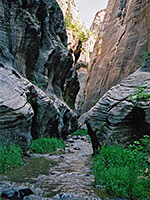 The streamway is followed a little more until just before the confluence, where the way is blocked by another dryfall, passed by hiking up a slope on the left side, then finally down 50 meters to a bushy area at the side of Kolob Creek - a point which marks the approximate end of the tightest narrows that extend 1.5 miles upstream (to beneath the last big dryfall - the 12th rappel if descending the whole canyon), and the slightly wider downstream section, which continues 3 more miles to the Virgin River. Like Parunuweap, the route into middle Kolob Creek takes a lot of description but once there, the hike simply involves walking up, or down, the streambed as far as desired. 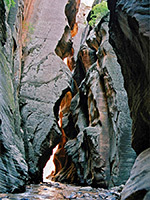 Upstream of the entrance, the 750 foot cliffs are soon vertical, dark and partly overhanging, as the water covers the canyon floor from wall to wall, and a good stretch of narrows begins. Such sections alternate with more open corridors where the river is flanked by sandbanks and bushes. If the flow rate is high, the creek forms deep pools, small waterfalls and fast flowing rapids that may hinder progress, though at some times of year the canyon will be completely dry. 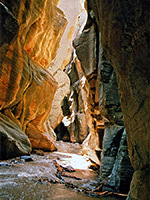 One option to explore the canyon would be to walk all the way downstream, through the Zion Narrows to the paved road, though this would require a car shuttle. If returning via the MIA route, the initial climb can be very strenuous in hot weather, though it can be done in as little as one hour.